Selenoid is a powerful Go implementation of original Selenium hub code. It is using Docker to launch browsers. Please refer to GitHub repository if you need sources. Running this command will configure and start Selenoid automatically. Please refer to corresponding Quick Start with Configuration Manager section for more details. This guide shows how to start Selenoid manually. When in doubt take a look at Configuration Manager first. This guide assumes you already know how to deal with command line and know basic Docker commands. For Chrome images "path" is "/" instead of "/wd/hub"
Download binary for your operating system from releases page and save it as selenoid (or selenoid.exe on windows). Add execution permission in case of *nix os-type with chmod +x selenoid. Selenoid was created to be run in big Selenium clusters and thus has no built-in user interface. This is why trying to open an URL above in browser returns 404 and this is the expected behavior. Where are recorded videos stored? Default location when installed with cm is ~/.aerokube/selenoid/video or C:\Users\<user>\.aerokube\selenoid\video. How can I limit overall browsers consumption? You have to use -limit flag to specify total number of parallel sessions. Default value is 5. See Resources Consumption section on how to determine total number of parallel sessions. Can I limit per-version browser consumption? No, this is not supported. We consider the only reasonable limitation should be the overall browsers consumption. This is important to not overload the hardware. How can I adjust Selenoid timeouts? How many resources browser containers consume? This depends on your tests. We recommend to start with 1 CPU and 1 Gb of memory per container as a rough estimate and then increase -limit checking that your tests work stably. Do VNC and non-VNC browser images memory and CPU consumption differ? The only difference between these images - is a running VNC server (x11vnc) consuming approximately 20 Megabytes of RAM in idle state which is negligible compared to browser memory consumption. You are using browser images with vnc in their name, e.g. selenoid/vnc:firefox:58.0. You are using driver.close() instead of driver.quit() and just closed the last browser tab instead of removing the session. Can Selenoid pull browser images automatically? No, we did not implement this feature intentionally. We consider that all such cluster maintenance tasks can influence performance and stability when done automatically. While we normally recommend to start Selenoid using Configuration Manager on any platform, it is possible to start it under Windows manually. Most of the differences are related to Docker, so please refer to Docker documentation on any errors first. The main difference from Unix operating systems is how volumes are mounted. In any Windows paths back slashes (\) should be replaced by forward slashes (/) and drive letter should be lower cased. Also start with forward slash and remove colon. > $current = $PWD -replace "\\", "/" -replace "C", "c"
All these images are free to use. See image tags for a list of supported versions. Build files are stored in selenoid-images repository. Feel free to create issues or request images for new versions. This feature only works when browsers are run in containers. Video can be recorded with both vnc or non-vnc browser images. An additional enableVideo capability should be added to tests. See Special Capabilities section for more details. Selenoid can capture browser screen and save it to MPEG-4 video file using H264 codec. Video recording works by attaching a separate container with video capturing software to running browser container. Mount a directory from the host machine (e.g. ~/.aerokube/selenoid/video) to store video files to /opt/selenoid/video. Pass an additional OVERRIDE_VIDEO_OUTPUT_DIR environment variable with absolute path to video directory on host machine. This is required because video recorder container, automatically created by Selenoid should save video to host machine video storage directory. When running Selenoid as a binary - videos will be stored in video directory inside current working directory. All these actions are automatically done when starting Selenoid via Configuration Manager selenoid start command. Direct link will work only after session has finished because Selenoid renames temporary filename to <session-id>.mp4 (by default) at the session close. Notice -mmin +120 argument meaning to only process files older than 2 hours (120 minutes). An additional enableLog capability should be added to tests. See Special Capabilities section for more details. Selenoid can save log files for every running session to a separate file. By default log files are saved as <session-id>.log but you can alter file name via logName capability. This feature is automatically enabled when starting Selenoid via Configuration Manager selenoid start command. Direct link will work only after session has finished because Selenoid renames temporary filename to <session-id>.log (by default) at the session close. Read the following note if you are using Selenoid without Docker. This feature is supported in WebDriver protocol by sending zipped file contents to /file handle. However not all driver binaries support this feature. For example this is not implemented in Geckodriver or IEDriver. When proxying requests directly to these drivers (i.e. when not using Docker) you need to start Selenoid with -enable-file-upload flag. In that case Selenoid will provide required API to tests. Firefox container images already include this parameter where needed. In order for this feature to work an HTTP file server should be listening inside browser container on port 8080. Download directory inside container to be used in tests is usually ~/Downloads. Start a new session, for example with ID f2bcd32b-d932-4cdc-a639-687ab8e4f840. Currently only Chrome Developer Tools are supported. Selenoid can improve some automation aspects with custom capabilities. You can pass it in tests to enable/disable some features. Then launch Selenoid UI to see the screen. This works by proxying VNC port from started container to http://localhost:4444/vnc/<session-id>; to WebSocket, where <session-id> is Selenium session ID. This capability sets only screen resolution - not browser window size. Most of browsers have some default window size value this is why your screenshot size can be smaller than screen resolution specified in capability. You should manually resize window to desired width and height. So far as our containers run headless browsers in Xvfb without installed window manager maximize operation does not work. You need to use setSize method instead. This feature requires some preparation. Please refer to Video Recording section for more details. This feature requires some preparation. Please refer to Saving Session Logs section for more details. If you wish to automatically save logs for all sessions, you can enable this behavior globally with Selenoid -save-all-logs flag. It is important to add log file extension. Timeout is specified Golang duration format e.g. 30m or 10s or 1h5m and can be no more than the value set by -max-timeout flag. You can find most of available time zones here. Without this capability launched browser containers will have the same timezone as Selenoid one. Entries will be inserted to /etc/hosts before entries from browsers configuration file. Thus entries from capabilities override entries from configuration file if some hosts are equal. In big clusters you may want to pass additional metadata to every browser session: environment, VCS revision, build number and so on. These labels can be then used to enrich session logs and send them to a centralized log storage. Later this metadata can be used for more efficient search through logs. Type: map, format: "<key>": "<value>"
Labels from this capability override labels from browsers configuration file. When name capability is specified - it is automatically added as a label to container. This capability allows to override S3 key pattern (specified by -s3-key-pattern flag) used when uploading files to S3. The same key placeholders are supported. Please refer to Uploading Files To S3 section for more details. Users are extracted from basic HTTP authentication headers. A new session request arrives to Selenoid. Selenoid -limit flag specifies how many sessions can be created simultaneously. It is shown as total in statistics. When requests reach the limit - subsequent requests are placed in queue. Queued requests just block and continue to wait. When there is a free slot for request Selenoid decides whether a Docker container or standalone driver process should be created. All requests during startup are marked as pending. Before proceeding to next step Selenoid waits for required port to be open. This is done by sending HEAD requests to the port. When a container or driver is started (ping is successful) Selenoid does a new session request just in the same way as standard Selenium client. Depending on what is returned as response on the previous step session is marked as created or failed. Created and running sessions are also included to used value. When a session is created Selenoid just proxies the rest of session requests to the same container or driver. 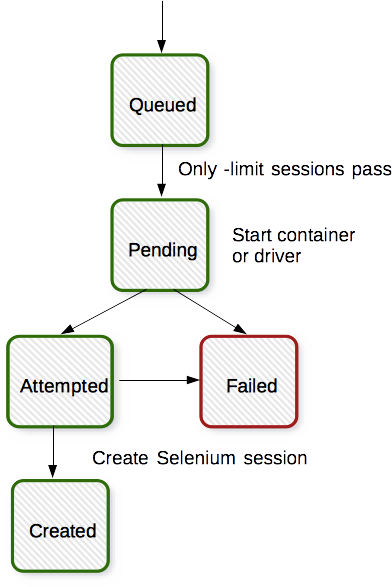 New session request can fail because of Selenium errors or issues with container \ driver startup. In that case an error is returned to user. Selenoid can upload recorded video and log files for every running session to S3-compatible storage. If you omit -s3-access-key and -s3-secret-key flags then environment variables and shared credentials file are automatically tried as a fallback. For example, when launching Selenoid with -s3-key-pattern $browserName/$sessionId/log.txt files will be accessible as firefox/0ee0b48b-e29b-6749-b4f1-2277b8f8d6c5/log.txt. You can also override key pattern for every session with s3KeyPattern capability. Sometimes you may want to upload only video files or files matching some complicated pattern or to not upload some files. To achieve this use -s3-include-files and -s3-exclude-files flags. These flags accept globs such as *.mp4. This feature only becomes available when Selenoid is compiled with metadata build tag (missing by default). Download latest IEDriverServer archive and unpack it to some directory (C:\ in this example). Notice that backslashes in Windows paths should be escaped as \\. In this example we define a browser with name internet explorer and version 11. To start Chrome instead just download Chromedriver binary and modify browsers.json accordingly. By default Selenoid does not process launched driver logs. Launch Selenoid with -capture-driver-logs flag to append driver logs for every session to main log. We recommend to use latest Docker release and Linux core 4.x and above. Older kernels and Docker releases have known bugs. Total number of simultaneously running containers (adjusted via -limit flag) depends on your host machine hardware. Our experience shows that depending on your tests the recommended limit is something like: 1.5-2.0 x numCores, where numCores is total number of cores on your host machine. 11 Optional. Custom /etc/hosts entries to be passed to browser container in hostname:ip format. 12 Optional. Shared memory size in bytes to be set for container. Some browsers (e.g. Chrome) may work unstable when having insufficient shmSize. Default value is 256 megabytes. 13 Optional. Containers only. Container CPU limit in Docker units. 14 Optional. Containers only. Container memory limit in Docker units. This file represents a mapping between a list of supported browser versions and Docker container images or driver binaries. If no version capability is present default version is used. When there is no exact version match we also try to match by prefix. That means version string in JSON should start with version string from capabilities. Image by default is a string with container specification in Docker format (hub.example.com/project/image:tag). Image must be already pulled. Configuration Manager can help with this task. Selenoid proxies connections to either Selenium server or standalone driver binary. Depending on operating system both can be packaged inside Docker container. port (only for containers) - You should use port field to specify the real port inside container that container process (Selenium server, Selenoid or driver) will listen on. tmpfs (optional) - You may probably know that moving browser cache to in-memory filesystem (Tmpfs) can dramatically improve its performance. Selenoid can automatically attach one or more in-memory filesystems as volumes to Docker container being run. To achieve this define one or more mount points and their respective sizes in optional tmpfs field. path (optional) - path field is needed to specify relative path to the URL where a new session is created (default is /). Which value to specify in this field depends on container contents. For example, most of Firefox containers have Selenium server inside - thus you need to specify /wd/hub. Chrome and Opera containers use web driver binary as entrypoint application which is accepting requests at /. We recommend to use our configuration tool to avoid errors with this field. volumes (optional) - This field allows to mount volumes from host machine to browser container. Should be specified as an array of Docker volume expressions: /host/dir:/container/dir[:mode]. env (optional) - This field allows to set any environment variables in running container. Specified as an array of NAME=value pairs. hosts (optional) - This field allows to add custom /etc/hosts entries to running container. Specified as an array of hostname:ip pairs. labels (optional) - This field allows to add custom labels to running container. Specified as an object of "key": "value" pairs. sysctl (optional) - This field allows to adjust kernel parameters of running container. Specified as an object of "key": "value" pairs. shmSize (optional) - Use it to override shared memory size for browser container. Install jq - a small tool to query data from JSON files. Why this is not the part of Selenoid? Well, this is easy to implement, but under heavy load the result can be unpredictable. For example after updating the file and reloading Selenoid it should pull new images. How long will you wait for new sessions then? What to do if Docker Registry is inaccessible? So for maintenance reasons it is easier to delegate such simple logic to external script. 1 is a supported Docker logging driver type like syslog, journald or awslogs. 2 Config is a list of key-value pairs used to configure selected driver. Use only one of these commands. It returns 200 OK when Selenoid operates normally. Additionally server uptime, last quota reload time and overall number of session requests from service startup are returned in JSON format. Restart Selenoid or hot reload its configuration. We recommend to use this approach on production clusters because Selenoid configuration is reloaded without restart. Edit browsers.json file and pull new browsers containers manually or using Syncing Browser Images from Existing File. Alternatively configure Selenoid without restarting it like shown in previous section. Here lastReloadTime field shows when browsers configuration was reloaded for the last time. So far as session ID is unknown when doing attempts this counter is used to find all session attempts for each new session request. Name and version. Only present for new session requests. For SESSION_ATTEMPTED entries means current attempt number. For SESSION_CREATED entries means total number of attempts to create this session. Requested VNC or logs for unknown session. Install Golang 1.11.4 and above. This will also fetch build dependencies. $ docker build -t selenoid:latest . Firefox 53.0+ images require Selenium client 3.4.0 or newer. These images work with any modern Selenium client version. Images for older Chrome versions were not built because we have no Debian packages. If you have such packages - we could create more images. We do not consider these images really stable. Many of base operations like working with proxies may not work. Images for older Opera versions were not built because we have no Debian packages. If you have such packages - we could create more images. Hardware server or virtual machine with nested virtualization support is required to run Android images. These images include VNC server and Android Quick Boot snapshot. Neither Chromedriver nor Chrome Mobile are installed. To test hybrid apps build your own image using provided automation script.